Engineering is fun with friends! See a sample of our after school activities. Kaleidoscope Enrichment is fully insured and provides talented, energetic, professional educators for your science, technology, engineering, math, and maker programs. Contact us today to plan your next workshop! Kaleidoscope offers a wide variety of summer activities that can be customized for your location. We offer everything from week-long Maker Camps to informal Science and Swim activities — and everything in between. For example, many of our standard programs can be customized to the needs of summer daycare programs as well. Kaleidoscope is also the perfect choice for your outdoor fair, festival, market or event, offering many different craft, science, engineering and naturalist experiences to draw in families. 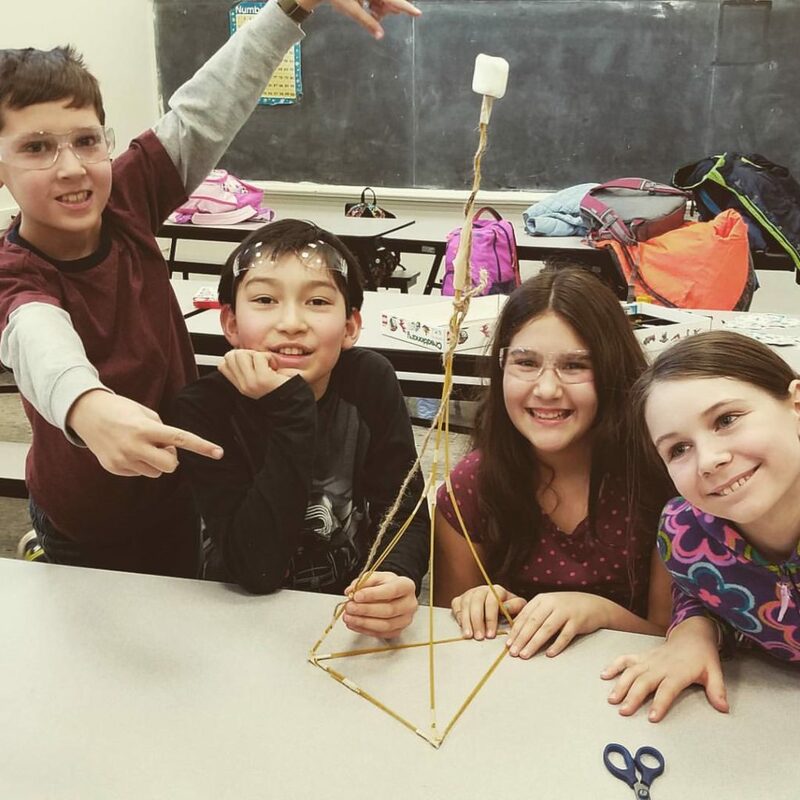 LEARN MORE ABOUT MAKER CAMP! LEARN MORE ABOUT SCIENCE & SWIM! After-school enrichment programs offer a wonderful opportunity for students to self-select activities that are meaningful to them while building academic and social skills. Without the pressures of grading and testing, many children feel freed to reach beyond their comfort zone. This creates the energy of discovery within students, sparking confidence and new ideas. Kaleidoscope programs give students the opportunity to challenge themselves while having the support, guidance, and leadership they need to feel successful while learning. Learn more about our programs through the Blairstown Recreation Department. Kaleidoscope knows that homeschooling is a dynamic, exciting way to both teach and learn. Because homeschoolers have so many diverse needs and methods, we offer programs that can be adapted to accommodate a variety of age ranges, learning styles and educational goals. Kaleidoscope programs offer flexible program pacing, group sizes, and content. We’ll listen to your needs and customize activities for your student, family or group. Kaleidoscope is always a winner in the classroom. We take the prep work out of big projects or special events. Our programs are aligned with national standards and Common Core, so you know they’ll fit your lesson plans, and our instructors have had background checks and been fingerprinted by the state. We also offer exciting assembly programs, perfect for holidays and the end of the year. If you need assessment activities or other support, just let us know. We’ve worked libraries for years to bring affordable, exciting STEM (science, technology, engineering, and math) and Maker programming across New Jersey. A Kaleidoscope workshop is perfect for NJ Makers Day, NJ STEM Month, National Engineering Week, Computer Science Education Week, Summer Reading Programs and much more. Don’t have a Makerspace? Not comfortable teaching coding? Call Kaleidoscope! We’ll bring everything needed for a fantastic program. Learn more about our programs with the Warren County Library System. Need help on a science badge? Want an exciting program for the next meeting? Have an event coming up and need activities? Kaleidoscope can help. As scouting parents ourselves, we know what it takes to keep kids interested and happy. Because we’ve worked with groups both big and small, in a wide variety of situations, so you can rely on Kaleidoscope to make your club or scouting activity fun, manageable and educational. Have an event coming up and want something special for the kids? Have a museum, learning center or other location that would like to add STEM (science, technology, engineering, and math) or Maker programming? Whether you need professional development for your staff, assistance planning workshops or want our education experts to provide the activities, Kaleidoscope is here to help. Learn more about our work with The Children’s Museum of Somerset County NJ. Kaleidoscope offers exciting parties full of hands-on, take-home projects. We have something for everyone — serene spa science, messy mad science, crazy engineering challenges, creative duct tape crafts and more! No matter what the age or interest, Kaleidoscope parties are always a hit. And we make it easy: we’ll come to your home or other location with everything but the food. Our parties are very budget-friendly, with a variety of pricing options and add-ons that make your party one-of-a-kind! Contact us today to plan your Kaleidoscope program or workshop!